Airport meet and Greet. Just look out towards the information desk located in the arrivals hall for your pick-up with your name on it. Quick road transfer to your overnight hotel. The Guest House is a charming property situated in tropical gardens on the outskirts of Entebbe, just 5 minutes from Entebbe International Airport. . A tastefully restored colonial homestead consisting of comfortable bedrooms. Each of them is decorated along African themes and has their own private bathroom. A diners’ bar is set in a landscaped garden with lake views. The main house includes a private dining veranda and living room for overnight guests. As names go, there's hardly a more evocative African destination than the Impenetrable Forest of Bwindi. This swath of steep mountains covered in thick, steamy jungle is just as magnificent as it sounds. The World Heritage–listed Bwindi Impenetrable National Park is one of Africa’s most ancient habitats, even surviving the last Ice Age as most of the continent's other forests disappeared. After an early breakfast, meet your driver at the lobby and transfer to Entebbe International Airport for a domestic flight to Western Uganda, departing at 07.00 or 07.45 hr. (check in time is 1 hr before departure) From Kihihi Airstrip (expected arrival at 08.45 / 09.30 hr) you will be met by a guide and transferred by road approx. 1hrs drive to the home of the endangered mountain gorillas. Arise early today and prepare for the highlight of your safari, an unforgettable encounter with the Gentle Giants of Bwindi! Upon sighting the gorillas, you spend the allowed one hour with them as they go about their daily life; feeding, moving, playing, raising their young and sometimes wrestling by the juveniles – it is a totally unique and unforgettable experience! Afterwards trek back to the lodge for lunch and a refreshing shower. After breakfast enjoy a 3hr guided forest walk in Bwindi Forest and later visit the Batwa – enjoy the walk in the forest as you prepare to meet the Batwa who have a lot in stock for you. Second morning of gorilla tracking where you will have an opportunity to see another gorilla family. Afterwards trek back to the lodge for lunch and a refreshing shower. In the evening, you will meet your safari guide from Great Lakes Safaris for a short brief. Set on the banks of the pristine Munyanga River and facing the Impenetrable Forest! A huge terrace wraps around the main building, from where guests can enjoy views of the forest and relax to the sound of the river flowing gently by. Sink into a chair in front of the fireplace in the living room with a book, or enjoy a drink from the bar before sitting down to dinner in the restaurant or out on the terrace. Most of the produce used is grown on-site to ensure everything is as fresh as it is delicious. Each suite features large double doors and windows and en-suite bathrooms with open terracotta showers, private balconies with panoramic views over the grounds, river and the surrounding forest. After breakfast, you will meet your guide and depart the impenetrable forest of Bwindi and head to Lake Mburo National Park. As we enter the park it is likely that you will spot some wildlife. After checking in you will go on a boat ride on the lake to view the rich bird life and many hippos that are cooling off. Have an early dinner before going on an optional (at extra fee) night game drive in an open Landrover with spot light. This special game drive of 2-3 hours provides good chances of seeing the elusive leopard and of course other nocturnal animals. 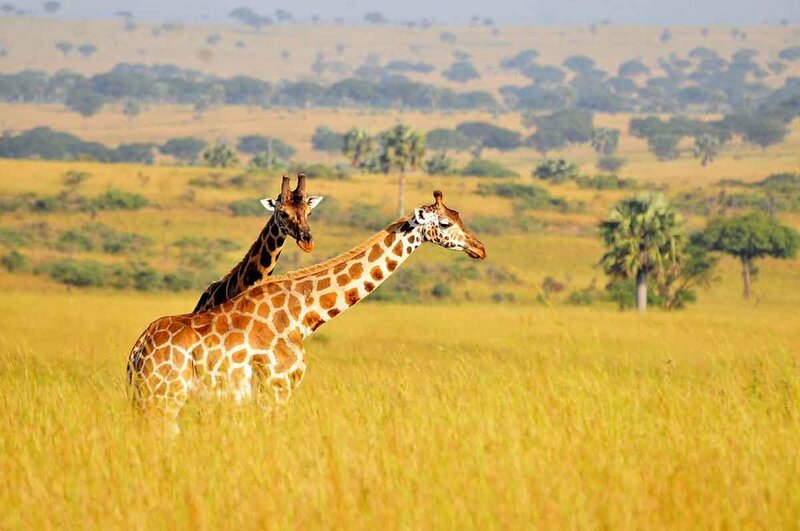 Lake Mburo National Park contains an extensive area of wetland and harbors several species of mammals not found anywhere else in Uganda. A peaceful and exclusive retreat adjacent to Lake Mburo National Park. Featuring 10 rooms which are built on wooden platforms with stilts, covered by a thatched roof. Suspended under the thatched roof is a spacious and comfortable tent equipped with an en-suite bathroom with stunning views, including hot and cold running water, showers, and flush toilets. Each luxury tented room is nestled on a private piece of the lodge's property, enabling guests to enjoy the tranquil environment in complete seclusion. Placed in varied settings, some rooms are situated in a forest, some with a lake view, and some on rocky outcrops. The main dining area is a large thatched structure built of rocks, the wood of dead, weathered olive trees found on the land, and native grasses. Below the dining area, an infinity swimming pool stretches out from the rocks and seems to disappear into the vast landscape beyond. From the dining and pool area, guests can enjoy the view of a westward oriented valley and its stunning evening sunsets over Lake Mburo National Park. Animals gathering in the valley provide guests with fantastic game-viewing opportunities or a chance to relax and watch wildlife at the waterhole below the pool. After breakfast head for Ngamba Island Chimpanzee Sanctuary for feeding sessions of the chimps. Return to Lunch at the mainland and thereafter you will be dropped off at the Airport for your international flight home. Flying home…dreaming of the trip of a lifetime!